TC1 | Danley Sound Labs, Inc. When it comes to horns, size matters. First, lets look at the basic relationship between size, frequency, and coverage pattern. The angle of the coverage pattern and the size of the horn are inversely proportional. This means that for a given horn size the wider coverage pattern will control the sound to a lower frequency. 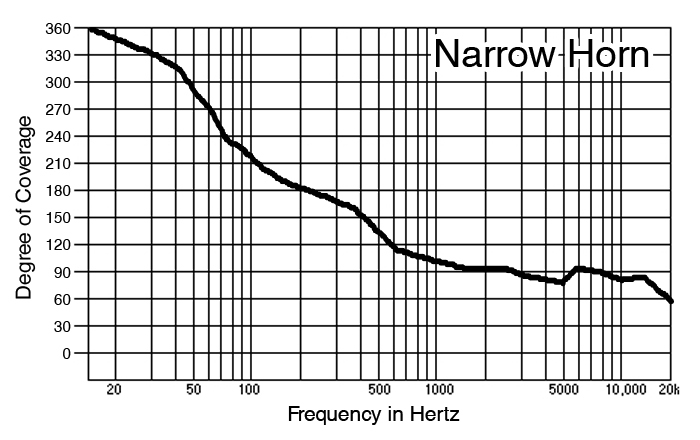 In other words, a narrower horn pattern must be larger in order to have pattern control down to the same frequency as the wider horn. 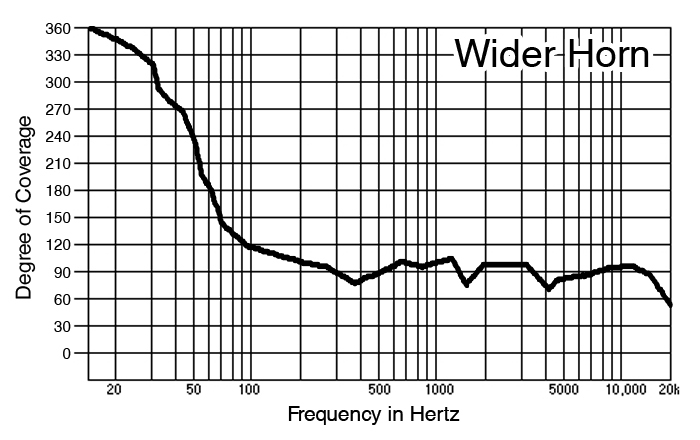 What the graphs show is that the small horn, rated at 90 degrees is only 90 degrees down to around 1500 Hz, whereas the larger horn maintains the 90 degree coverage down to almost 200 Hz. Most everyone agrees that sound should go to where there are ears and not to walls and ceilings where there are no ears. Indoors, sound that hits surfaces before it hits ears can result in lower intelligibility among other things. Outdoors, sound that is not aimed at ears is simple wasted energy. Part of the job of a loudspeaker system is to provide “pattern control” or some way to direct the sound where it should go, and keep it from going to where it should not go. Therein lies the rub! There are basically 2 ways to control sound. One way uses interference. We at Danley feel that interference is almost always a bad thing and not a very good way to control sound. We have chosen to use full range, large horns, for the simple reason they work better! They sound better and they control better! What’s not to like? “If Bad Sound Were Fatal, Audio Would Be the Leading Cause of Death” Don and Carolyn Davis. Danley Sound Labs, the antidote!